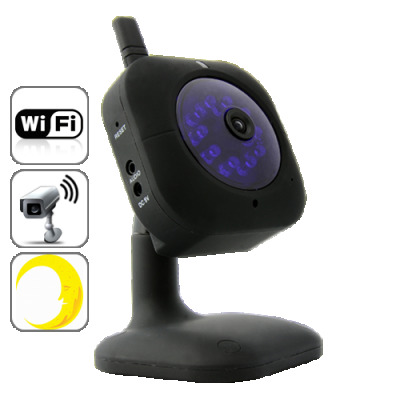 Successfully Added Wired / Wireless IP Security Camera with Nightvision and Alarm Input/Output to your Shopping Cart. Handy Wired / Wireless IP Security Camera for use in your store, home, office, or anywhere else you need instant and remote security surveillance. Also includes automatic nightvision, which makes keeping an eye on people and possessions easier and more affordable than ever! Wired and wireless use: With both wired and wireless LAN connectivity, this IP camera can connect to your router either via a reliable wired Ethernet cable or over WiFi for maximum convenience, making positioning very flexible. 24/7 surveillance - night or day: Featuring 10 LED lights for automatic nightvision when it turns dark, this Wired / Wireless IP Security Camera can be used at any time, any place! It also includes a mic so you can listen in, as well as provide two-way audio if you connect speakers to the IP camera. Finally, you also get plenty of alarm/alert functionality, including motion detection and email alert. Wow! Most affordable price yet: This Wired / Wireless IP Security Camera could easily sell for much more, but thanks to our strong purchasing power we can now bring you this amazing surveillance device at an unheard of factory direct low price! If you’re looking for an IP camera with great performance, advanced functions and simplicity of use, then look no further. Order now while supplies last, brought to you by Chinavasion.